This article is about the character. For the guest star, see Sarah Michelle Gellar. Sarah Michelle Gellar is an American actress. 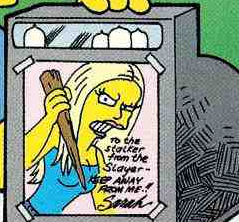 In Comic Book Guy's letter to Santa Claus he wrote that he wanted the entire run of Buffy Figures to be delivered by Buffy herself, Sarah Michelle Gellar. Modified on September 29, 2012, at 09:16.